Like all automobile enthusiasts, nothing gets Brian Donovan’s heart racing like the sight of a gorgeous Mercedes, the intoxicating fumes of a finely-tuned Porsche or the thunderous roar of a Jaguar’s monstrous engine. His love for all things mechanical led him to a successful career as an engineer for GE, yet his passion for automobiles motivated him to pick up vintage racing and restoration as a hobby. So in 1990, he audaciously decided to turn his avocation into his life, and so Donovan Motorcar Service was born. 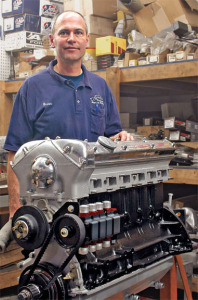 Given his genuine affection and devotion to cars, Donovan’s brainchild has rapidly become the most well-known and trusted source for service and restoration of vintage British, European and domestic automobiles including Audi, BMW, Bentley, Jaguar, MG, Mercedes, Porsche, Rover, Saab, Triumph, VW, Volvo and more. Also within his company’s cavernous stables resides the Jaguar Vintage Racing Team, one of the decade’s most successful squads in the vintage racing world managed by none other than Donovan himself. Passion and Trust for Fine Automobile Service, Restoration, Sales and Vintage Racing.